This was my first visit to Coll. The threatened wind and rain had not fully materialised, passing over to the east and the evening proved to be warm enough for me to eat outside, sitting comfortably in my new Helinox chair (worth the money and the wee bit of extra weight) and then head down to the hotel for a drink in the garden. Then up the hill again and in to my sleeping bag. I woke to wind and rain battering the tent. Tea and breakfast made on the Trangia (inside the Duolite Tourer tent’s capacious porch). Then down to the community centre for a shower. The new centre in the main settlement, Arinagour, is a simple, attractive building which has a bunkhouse next door and showers and toilets accessible through a side door 24 hours a day, for wild campers. Showers cost a pound and are powerful and hot. 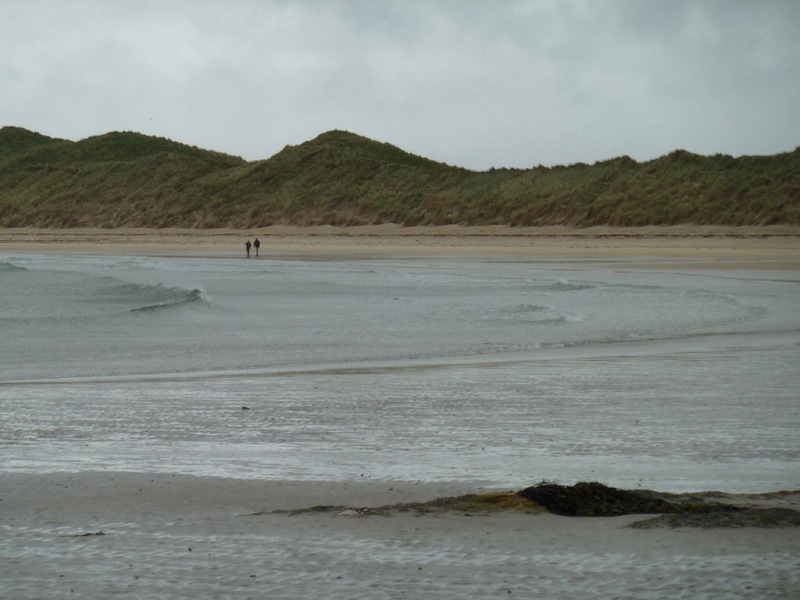 The rain was easing, but not the wind, a strong cold north easterly. I prepared the bike for a sort of Coll circular, up one of the roads out of Arinagour round the northern bit of the island to Sorisdour and back down to join the other road to Arinagour. This involved using a short stretch of track, which looked short enough to walk if it proved too tough to ride. The 5 miles to the north of the island felt like 50… A powerful headwind did its best to force me back down to Arinagour, occasionally throwing in bucketfuls of harsh, stinging rain. Then, once at the top, there was probably a great view across to Ardnamurchan. Except the low cloud and drifts of wind driven rain obscured most of it. Then back down the same road, passing the turn to Arinagour and carrying on down the western side of the island where the road stops at about half way down and becomes a track, muddy and messy which meets up with the road that curves back round past the airfield to the southern side of the island and Arinagour again. There are several beautiful sandy beaches off this road and I took a track through the dunes down to the biggest of these, Crossapol Bay. After struggling back up the track, mostly cycling but some pushing where the sand was particularly loose and deep, I checked out the listed campsite on the island, in a walled garden near the sea. It looked pleasant enough, but not enough to tempt me, in this wild, wet windy weather anyway, to break camp and move. 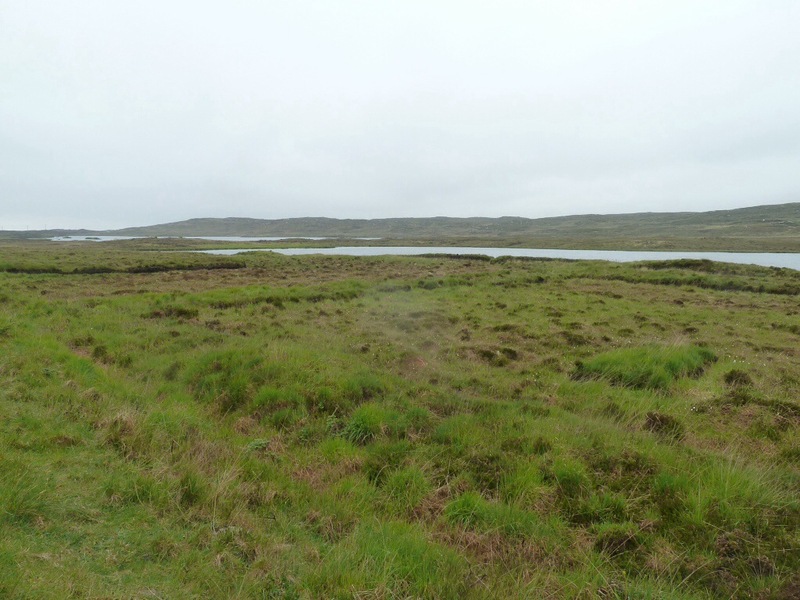 On the way back to Arinagour, a group of large rabbits with very large ears shot out from behind a rock and began to zig zag away over the wild heathland….then I realised it was a family of brown hares. I stopped and watched them for a while. Then back to Arinagour, a visit to the shop for provisions… cooking in the tent out of the wind and rain and then to the hotel bar, again to shelter from the wind and rain. It is a friendly little place. Two bars…the public is bigger and the locals are very friendly. The lounge is more comfortable, but small and tends to get full quickly with visitors, some friendly, some not so much. I perched on a bench in the public bar and got chatting with the man who reads the meters on the privately owned wind turbines, of which there are quite a few up here, some owned by individuals and some by whole communities. I left the bar well past ten, as the sun was setting. The rain had passed and the wind had dropped slightly. I had cycled every road on the island and a few of its tracks and although this still amounted to less than 30 miles, I was tired…the headwinds for half of that route had been exhausting. I planned to brew a hot chocolate and then sit and watch the sun set. However, not only is sunset late up here, it takes ages and by the time I gave up and crawled in to my sleeping bag, it was still not fully dark. Up the next morning, local eggs fried with tomatoes and a soft roll for breakfast. That and several cups of hot tea gave me the energy to start breaking camp ready for the next stage of this island hopping journey. The Thursday ferry to Castlebay on Barra, makes extra stops at Coll and Tiree and I had a ticket for it in my pocket already. The Hopscotch deals from Calmac are a real bargain. Me and my bike, a ferry to Coll, another to Barra, a third from Barra to Eriskay, number four from Berneray to Leverburgh on South Uist and a fifth would take me back to the mainland at Ullapool in a fortnight’s time. All for forty quid. Quite a few sea miles in that itinerary. 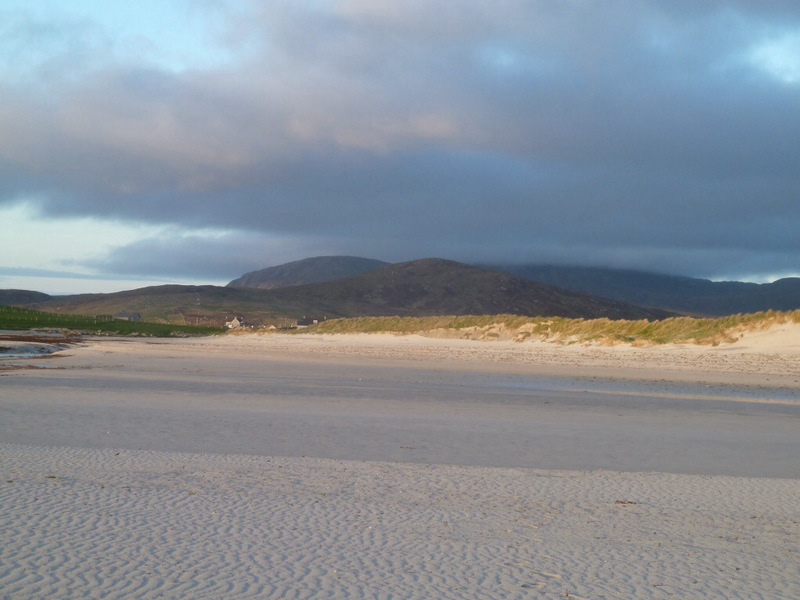 The second of those trips, Coll to Barra was one of the longest. 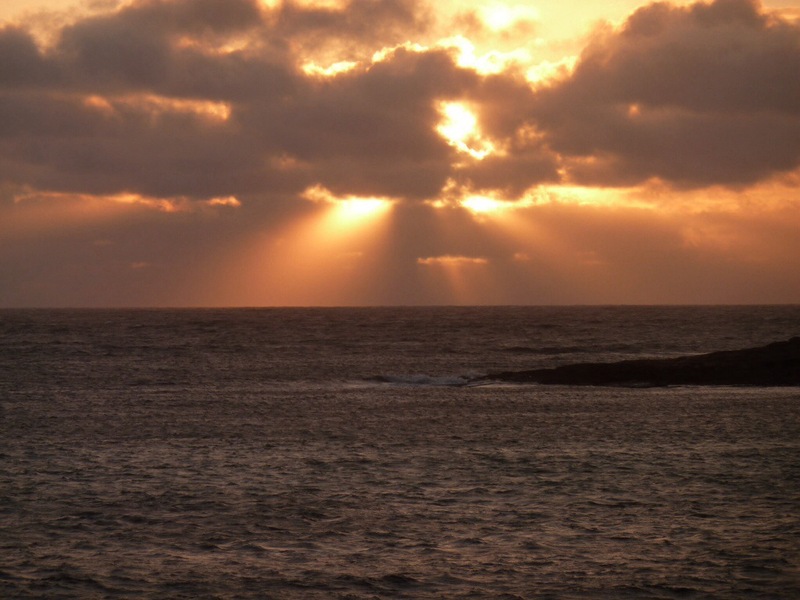 It ended up being four hours crossing the Minch and was pretty rough once we were out of the Sound of Mull. 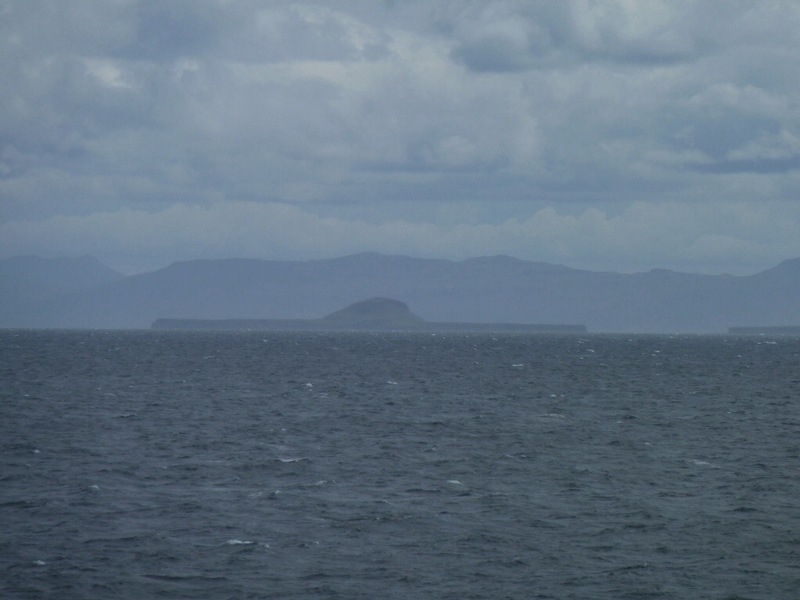 But there were still some interesting views I had not seen before, including this interesting island, the Dutchman’s Cap or Bac Mor, part of the Treshnish Isles. On land the winds were blowing up to about 30mph. Gusts stronger. At sea, some poor passengers found this tough. Quite a few spent long periods in the toilet and their sufferings echoed round the ship. 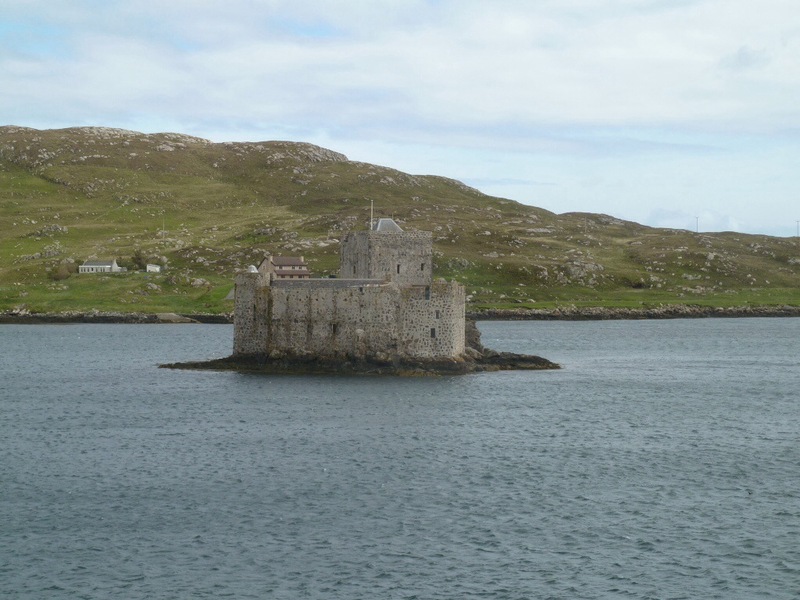 I had expected to feel the same when I saw the expected wind speed…I had made a crossing to Barra over 30 years before, on a much older, pretty basic vessel, that pitched and rolled quite dramatically in the rough seas. I was quite ill then. However, this ship seemed much more stable in the roughish sea and provided I didn’t walk around too much (which was pretty tricky anyway) I felt fine. Disembarking at Castlebay, with its distinctive stone castle cast adrift in the bay, it was still pretty windy. A north easterly, not the expected south westerly at all .However, I wasn’t too bothered as I was heading over the causeway on the south side of the island, to Vatersay. 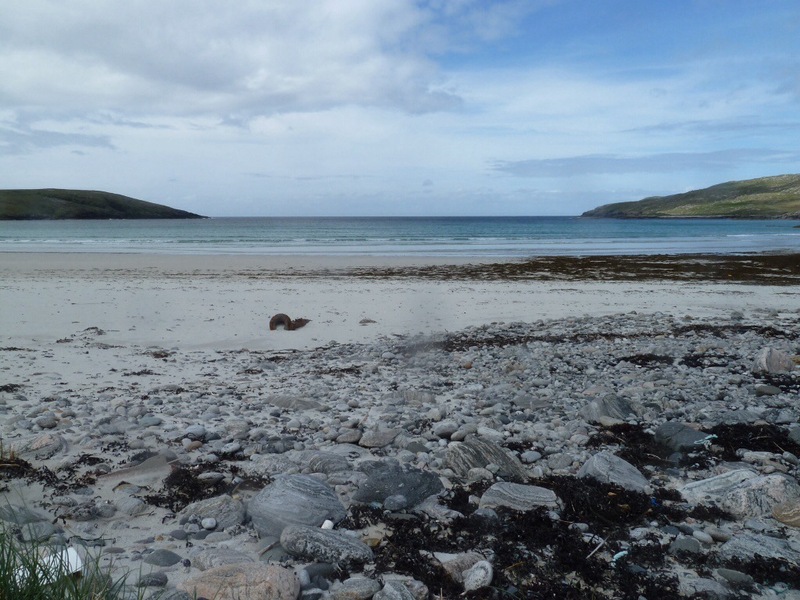 On my last trip, 15 years ago, there had been no causeway and the winds (south westerlies then but stormy ones) had been exceptionally rough and wild, too stormy for our planned kayaking trip, or even the little ferry that used to cross between Barra and Vatersay. 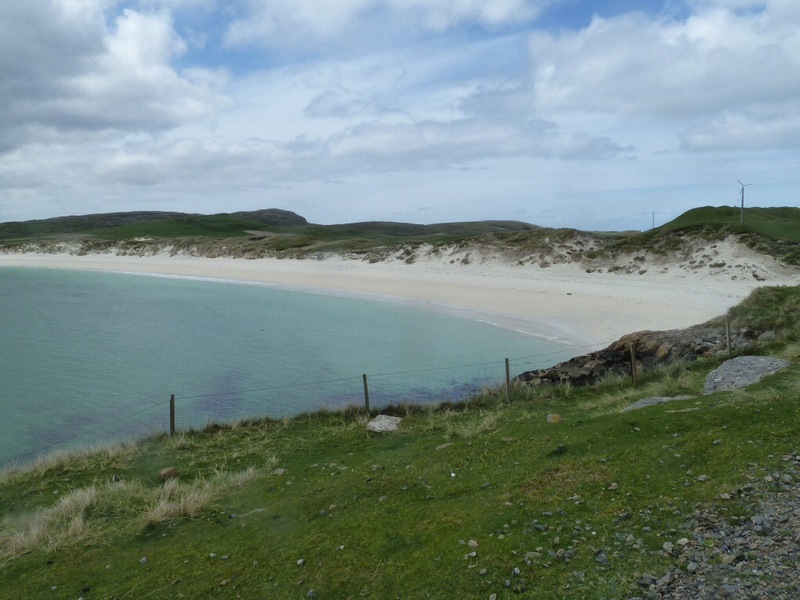 So I had not been able to show my daughter this little island and its lovely wild camp beach spots. That’s where I was now headed. There were far more fences than I remembered, but eventually I found a way through to the dunes with the bike and pitched the tent in a reasonably sheltered spot, out of the biting north wind. The wind may have been tough and cold, but at least it was dry and beautifully clear…the views and sense of space on this wide beach were just as beautiful as I remembered. I wrapped myself up in my sleeping bag and sat in my little chair, mixing up a pasta dinner, finished off with a cup of hot chocolate, fortified with a tot of whisky. Great end to the day. I was hoping that the wind would have dropped by the morning, or at least shifted to a warmer and more helpful direction. But it hadn’t. It was still gusting down from the north east, completely the wrong direction for a cyclist planning to ride out of Vatersay through Barra and up to Berneray. It was possiby blowing a little less briskly than the previous day but was still strong and very cold. After a breakfast of porridge, fruit and chocolate, which I figured I would definitely need and deserve after a few hours of fighting this headwind, I broke camp and headed on out. Back over the causeway, up and on to Barra…my plan had been to ride round the island before heading up to the ferry at Ard Mhor in the north…but as I battled up the hill west of Castlebay, I began to realise that this would be no fun, in such a strong headwind, except for the short section where the wind would be behind me. As I passed the Barra Beach hotel at Borve, I saw a sign for a campsite. I made a new plan..stay one more day down this end of the Hebrides, ride round the island unencumbered by luggage, and hope the wind would drop for tomorrow. The site at Borve is relatively new. Small, quite a few motor homes, but very pleasant. Great Atlantic views. A small, clean building houses the shower and toilet block as well as a small kitchen and laundry room. Friendly owner, too, the local postie. Although windy, it was still a clear, bright sunny day. But cold, so cold that as I rode through Castlebay an hour or so after pitching my tent, I realised the gloves I had were not keeping my fingers warm at all. So I stopped off at the big, grey house at the top of the street down to the harbour. Which is in fact a hardware store,the old fashioned kind which stocks a huge range of items from paint, nails and screws through to kitchen goods to stationery and underwear. And gloves, warm full fingered ones for less than a fiver. My hands now cosily protected from the wind chill, I continued my circular tour, up the even bigger hill on the east side of the island, into the wind, then across the top battered by cross winds. Only a few miles, sure, but it felt like five times the distance. Finally, as I began to complete the circle, I suddenly felt the wind almost sweep the bike up and cast it forward. Instead of having to pedal to keep going even on the downhills, I was now coasting along at speed. I got slightly carried away by this and sailed past the campsite back towards Castlebay. There is now a fairly well stocked Coop just outside Castlebay, so I propped the bike up outside, and popped in. My 15 year old memories of the Hebrides were that food shopping opportunities were scarce and fresh fruit and vegetables scarcer. However, I was able to choose from a decent selection of fresh fruit and veg, although the lack of fresh fish seemed odd in a shop in an island community. Back up the hill and into the headwind for the 3 or 4 miles to the campsite. I had only ridden maybe 20 miles or so that day. Yet my muscles were responding as though I was nearing the end of a hilly ride of double that distance. I was looking forward to some hot food to insulate me against the wind, so prepared a pot of cauliflower, spinach and chick pea curry, then boiled up some rice to go with it. I found a sheltered spot, wrapped myself up in hat, warm jacket and sat down to eat, while watching the sun set over the Atlantic. By 11ish, a few stars were visible, the brighter ones, although it was still not fully dark. I had still not managed to stay awake to see a completely dark sky since getting this far north. I crawled into my tent, leaving the door open to lie out, watching the stars slowly increase in number as the dusk light faded slowly. It still didn’t seem to get completely dark and the one downside of these long hours of daylight seemed to be that the full complement of stars was not going to emerge. Maybe three hours later, I awoke, absolutely freezing with the tent door still open. I hurriedly, and sleepily, zipped it up and dived down into the depths of my sleeping bag, to sleep till well past dawn. Next morning, the wind was still blowing in the same direction. Bad. But it had dropped a little in intensity. So a bit better. It was still tough going. 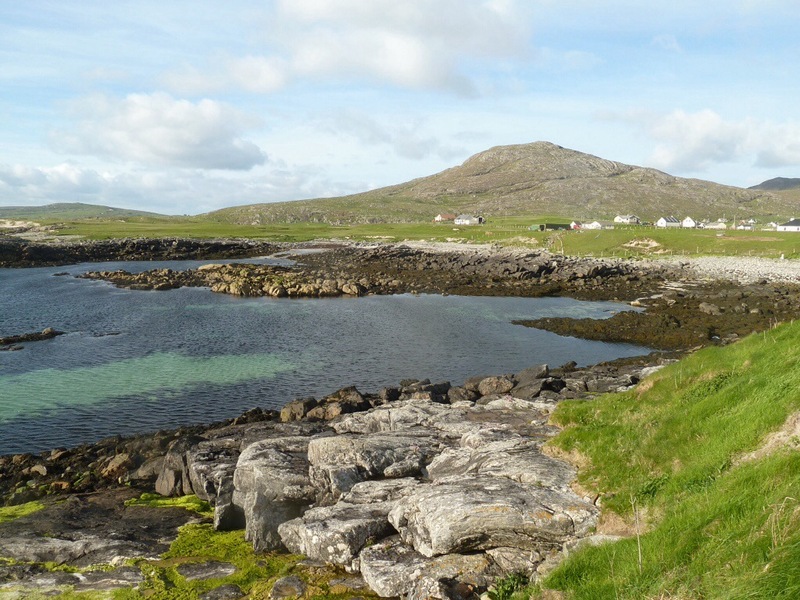 I reached Ard Mhor and was soon on the ferry heading for the little island of Eriskay from where one can ride across the causeway into South Uist. Lovely tandem and trailer ridden by a Swiss couple alongside my bike on the ferry. 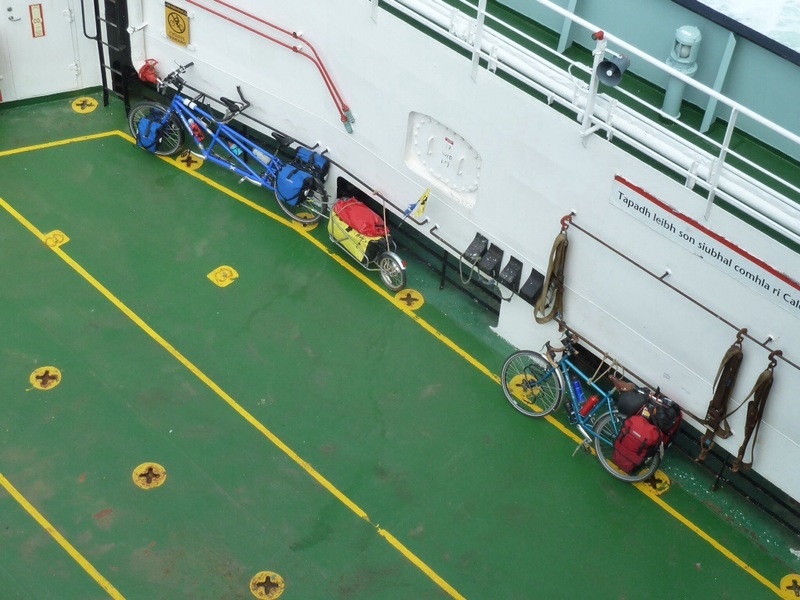 Another 10 bikes out of shot on the other side of the ferry. The road through South Uist is pretty flat, following the low lying ground alongside the slightly higher ground to the east of the island. The effects of any wind seemed magnified as it whipped across, straight into my face, the bike and panniers acting like a windbreak Great if it’s behind you. Not so great if it’s a headwind. Over the next 20 miles I averaged about 7mph. Even though there wasn’t a single hill to climb. I knew from previous visits that there was a very nice Gatliff hostel not that far away and decided not to press on to Berneray that day, but to take the easy way out and turn off this road which had become the wind tunnel of doom and head for the hostel. Howmore Hostel, is one of the Gatliff trust buildings. 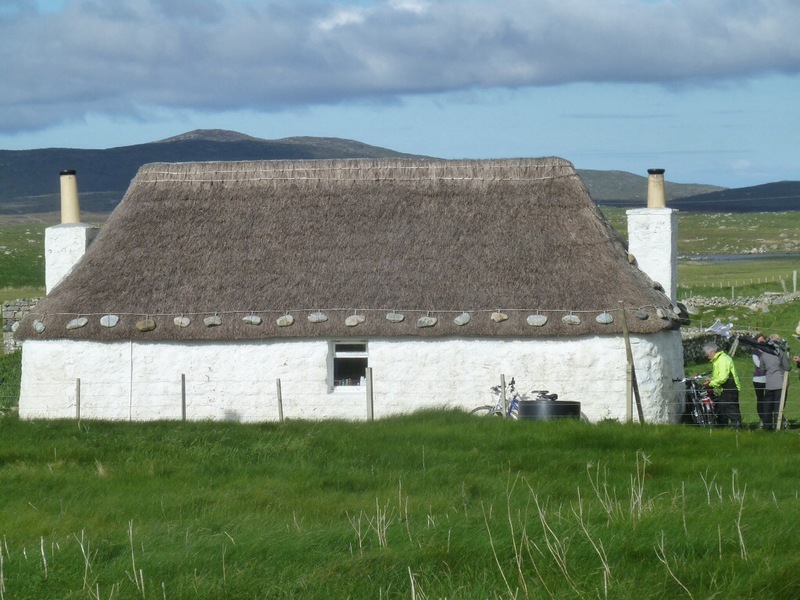 They now run three hostels in the Outer Hebrides, the Blackhouse Village Museum at Garenin now having taken over the one they ran there. These hostels are great places, never turn anyone away, are open all hours. The local people who oversee them tend not to be around much, consequently you are pretty free to do what you want, and when they do turn up, are invariably friendly and helpful. This one was full of cyclists! In fact that was one of the first big changes on this trip compared to our visit fifteen years ago. Then my daughter and I had been pretty unusual in our transport choice. I think I remember bumping into a German couple on South Uist and two Swiss guys in Lewis riding bikes plus two people trying to ride the postman’s track from Rhengidale to Tarbert. And that was it. Now, fifteen years later, on the Oban Barra ferry there had been at about 15 bikes, none of which had headed to Vatersay, they had all gone north straightaway. So were presumably already a day ahead of me….those in the hostel had arrived yesterday, and like me, had given up in the headwind. Some camped outside the hostel.. Others, like me, opted for a bed inside…. The second difference : The hostel had showers…15 years ago you had to make do with a sink wash. Definitely a welcome change after struggling into that headwind. The conversation round the table that night flowed quite nicely with the help of an assortment of alcohol. I discovered that one of the guys there was at the same Rock Against a Racism gig in Victoria Park that I had attended, forty years ago nearly. It struck me then, that everyone at the hostel was well over forty, very different to the ages of visitors I remembered 15 years ago, which were much more diverse. Possibly a side effect of travelling outside the school holidays, which I have never really done before. Around 9.30pm I decided to walk down to the beach….I remembered it as being a great place to view the sunset, as it faces due west. The walk down from the hostel takes you through the dunes and on to a wide stretch of pale golden, almost white, soft and very fine sand. The last time I was here, my daughter and I had tested the strength of the strong south westerly that had blown us up from Barra on our bikes, by leaning back as far as we could against the wind. By now the sharp, bitter north east wind that had done it’s best this time to keep me firmly in Barra that day, had dropped to a stiff cold breeze. 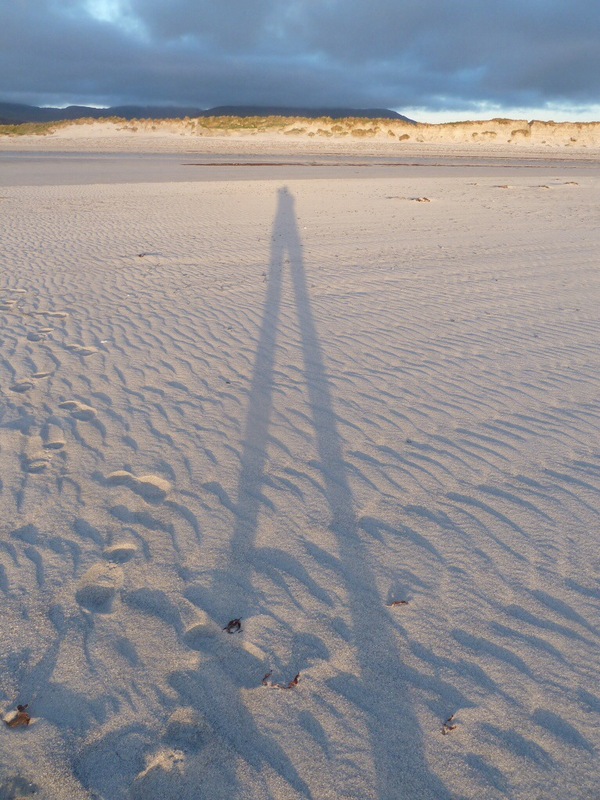 The one good thing about a north east wind is that it rarely brings rain and it was a beautifully clear crisp evening, with the light of the slowly lowering sun lengthening my shadow bit by bit almost as I watched. The next morning I was up very early and took my porridge and tea outside the hostel to sit in the sun. Carefully placing my back against the wind, which still had a fair amount of north easterly force in it, I looked out towards the ruined church next to the hostel. I could hear corncrakes calling through the reeds, a sound I have heard before in the Uists. Like one of those old football rattles, rather irritating to be honest. Then I saw two birds, speckled squat things, emerge from the reeds in the field and run across to the next patch of reeds. I may have heard corncrakes before, but this was the first time I had seen them.